In this companion book to the award-winning Stolen Child, a young girl is forced into slave labour in a munitions factory in Nazi Germany. In Stolen Child, Marsha Forchuk Skrypuch introduced readers to Larissa, a victim of Hitler’s largely unknown Lebensborn program. In this companion novel, readers will learn the fate of Lida, her sister, who was also kidnapped by the Germans and forced into slave labour — an Osterbeiter. In addition to her other tasks, Lida's small hands make her the perfect candidate to handle delicate munitions work, so she is sent to a factory that makes bombs. The gruelling work and conditions leave her severely malnourished and emotionally traumatized, but overriding all of this is her concern and determination to find out what happened to her vulnerable younger sister. With rumours of the Allies turning the tide in the war, Lida and her friends conspire to sabotage the bombs to help block the Nazis’ war effort. When her work camp is finally liberated, she is able to begin her search to learn the fate of her sister. In this exceptional novel Marsha Forchuk Skrypuch delivers a powerful story of hope and courage in the face of incredible odds.Lida and her younger sister are caught by the Nazis and separated. Lida is sent to a slave labour camp, where she works from dawn to dusk on only bread and soup. clad in one thin dress and no shoes. Even if she manages to survive the war, how will she find her sister again? I couldn’t put this book down! Whenever I read about life in a work or concentration camp, I am shocked and saddened that people could ever treat other people in such a cruel and inhumane way. At times, this book made me feel very emotional. I was rooting for the main character, Lida, and her friends to survive. The author did a great job of creating a character that I cared about. I liked the way her research blended seamlessly into the story to create a compelling read. Now I want to read her other book about Lida’s sister, called Stolen Child. As a writer, I would study this novel to see how every detail was portrayed through the main character's perspective. There is nothing unnecessary to the story here. Marsha Skrypuch didn’t learn how to read until she was in grade 4, when she taught herself by reading the fat book, Oliver Twist. Her book, Stolen Child, won the 2011 SCBWI Crystal Kite Award for the Americas. For more, visit Marsha Forchuk Skrypuch’s website. This looks like a very interesting book. The war through a child's eye. I found it very interesting, Patti. Reminded me of how the world has changed...or maybe not changed as much as it could. Wow, she wrote so many books! A wonder she's been off my radar. Thanks for the review. 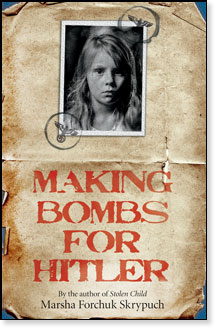 Thank you so much for reading and reviewing Making Bombs for Hitler. I just finished writing a third linked WWII novel, this time from Luka's perspective. It will be coming out in Feb 2014. Thanks for stopping by my blog, Marsha! The new book sounds like a good one. I'll definitely be looking for it. Books about that time period are fascinating. Thanks for giving us a heads-up about this one, Andrea. How amazing that Marsha didn't learn to read until she was in fourth grade! I know. I love hearing about authors who didn't like writing or reading when they were younger. It just shows how powerful stories can be! Sounds like a great book. Being Jewish, I read a lot of books about that time period when I was a kid. I really enjoyed reading it, though it was heart-breaking. Wow, she has written so many books. This sounds like a good one. Thanks for the review. This book sounds amazing. I am definitely going to read it. I find books on this topic so sad, but they draw me in. I visited two concentration camps when I went to Poland a few years ago. They took my breath away and I learned so much at them. Thanks so much for this review. I went looking for her in my library and found Stolen Child, another WWII book. I had never heard of the Lebensborn program--it is truly unbelievable how much evil Hitler perpetrated! Kudos to Skrypuch for telling stories we need to hear, and for making them compelling reading.